For the Buenos Aires Internaitional Airport locatit in this ceety, see Ministro Pistarini Internaitional Airport. Ezeiza is the caipital ceety o the Ezeiza Partido athin the Greater Buenos Aires aurie in Argentinae. The ceety haes a population o 93,246 accordin tae the 2001 census [INDEC]. Ezeiza is ane o the fastest-growin ceeties in Argentinae; the ceety an its surroondins are kent for the mony gatit commonties thare, as well as for the Ministro Pistarini Internaitional Airport. Ezeiza an its surroondins is an affluent aurie whaur mony well-tae-dae fowk live. Inhabitit oreeginally bi the Querandí fowk, the first Conquistador claims tae laund in the aurie teuk place in 1588. The first estancia (Los Remedios) an chapel in the aurie wur foondit bi Juan Guillermo González y Aragón in 1758; ane o González's great-grandsons wis Manuel Belgrano, ane o the maist notable leaders o the Argentine War o Unthirldom. Gerónimo Ezeiza bocht laund nearbi in 1767, an bi the late 19t hunderyear his stryndant José María Ezeiza became the lairgest laundawner in the aurie. Follaein his daith, Ezeiza's son-in-law donatit laund tae the Buenos Aires Western Railway, an the toun wis foondit aroond the new line on 17 Julie 1885; it wis namit in honour o the late José María Ezeiza. Cloverleaf interchynge atween the Ricchieri Freeway an the Ezeiza-Cañuelas Freewey, near Pistarini Internaitional Airport. The Barrio Uno subdiveesion is visible on the upper richt-haund corner. Dairy fermin dominatit the Ezeiza landscape durin the early 20t hunderyear. 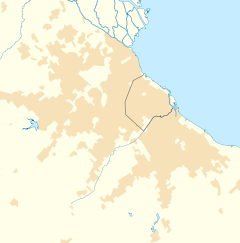 The toun wis chosen as the steid o the naition's first internaitional airport, which wis inauguratit on the northren end o the ceety in 1949; a new neebourheid, Barrio Uno, wis biggit juist north o the airport that year tae hoose its employees, an the Ricchieri Freeway wis opened in 1952 tae connect the new airport tae the ceety o Buenos Aires. The Naitional Atomic Energy Commission established the Ezeiza Atomic Center, a leadin producer o radioisotopes for medical uise, in 1967. The freewey wis scene o the Ezeiza massacre, in which at least 13 dee'd in clashes atween left an richt-wing Peronists vyin for the best vantage pynts frae which tae view the motorcade for exiled umwhile Preses Juan Perón upon his return tae Argentinae on 20 Juin 1973. Ezeiza grew steadily afterward as a bedroom commonty, an a nummer o gatit commonties wur developit (pairticularly in or near Canning, sooth o the ceety) frae the 1990s onwaird. The Bosques de Ezeiza ('Ezeiza Firths') are likwise a important tourist attraction for the aurie. Ither important institutions include the Dr. Alberto Eurnekian Hospital (2008), an the Provincial Varsity o Ezeiza - which opened its doors in 2012 as the first varsity dedicatit tae aeronautics in Laitin Americae; a proposal wis submittit later that year tae the Naitional Varsity Cooncil bi the schuil for its naitionalization. Pairt o Esteban Echeverría Partido syne its establishment in 1913, Ezeiza wis made the seat o its namesak partido upon its awn establishment in 1994. A new, postmodern ceety hall wis inaugurated in 2007. Wikimedia Commons haes media relatit tae Ezeiza. ↑ 1.0 1.1 1.2 "Historia de Ezeiza". Municipalidad de Ezeiza. ↑ "Presidencia de Cámpora". Todo Argentina. ↑ "Razones para la Nacionalización de la Universidad Provincial de Ezeiza" (PDF). UPE. ↑ "Esteban Echeverría". Historia Metro. ↑ "Inauguran el edificio Municipal en Ezeiza". 26 Noticias. ↑ "Climate Statistics for Ezeiza Aero, Argentina 1961–1990". National Oceanic and Atmospheric Administration. Retrieved March 31, 2014. This page wis last eeditit on 11 Mairch 2018, at 15:15.